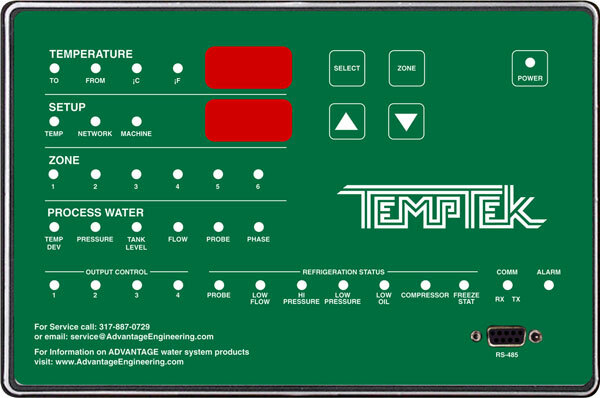 Temptek MW Series water-cooled central chilling modules use mechanical refrigeration to cool recirculated fluids that support industrial process cooling applications. 20°F to 70°F process fluid temperatures. 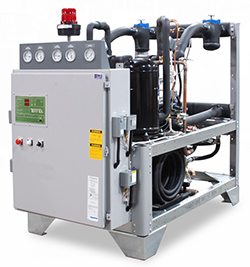 MW Series chillers combine one or more refrigeration circuits to chill fluid. A separate reservoir and pumping system is required to circulate chilled fluid to the use points. Water-cooled chillers require a secondary water source (typically cooling tower water) to dissipate the heat from the refrigeration system. 1. Since product innovation and improvement is our constant goal, all features and specifications are subject to change without notice or liability. Selection of certain optional features MWy change listed specifications. 2. Tons capacity at 12,000 BTU/ton per hour @ 50°F LWT @ 115°F condensing temperature. Capacities MWy be +/5% as reserved by the compressor MWnufacturer. Capacity multipliers are 50°F - 1.00 ; 40°F - .80 ; 30°F - .60 ; 20°F - .40. The minimum recommended operating temperature when no glycol is used is 48°F. 3. Flow rate (GPM) is based on 60°F city water source with a clean condenser. 4. Flow rate (GPM) is based on 85°F tower water source with a clean condenser. 5. Full load amps are higher than run load amps and must be used for sizing disconnects and supply wiring. Not for construction. Consult factory for power requirements of unit as configured and on selected options. 6. Consult factory for 50HZ operation. 7. Approximate dimensions. Not for construction purposes. 8. Unit weight crated for shipment. Image shown is typical. Actual unit appearance will vary according to specifications and options.